1.) I woke up singing "I Surrender All" in my head this morning. What do I need to surrender? I think I've surrendered all of myself already, but am I still holding on to something? Am I going to be required to surrender something in the near future? I know it shouldn't, but that last part makes me a little nervous. Is he not with the great Teacher even now? All that he is learning is from the Master himself! The One who does not lose His temper. The One who is not selfish with His time and attention. A mother wants what is best for her child, even if it means self sacrifice. I pale in comparison to Him. Maybe it is these thoughts of Christian and what "I" am missing out on that I need to truly surrender? Oh Lord please help me! I want to be fit! 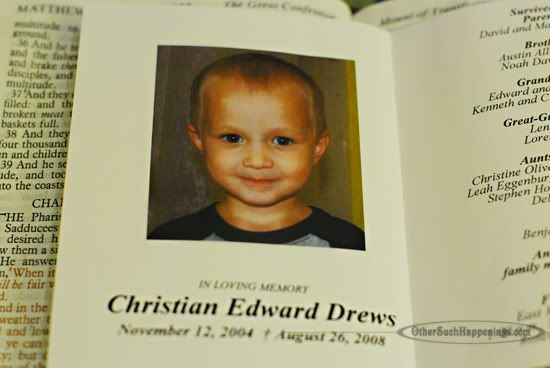 I know it is okay and good to remember Christian. But I must not yearn for my life that was. It would make me useless to fight in the battle now. It would distract me from looking to God and to eternity. If your hand is at the plough and you walk forward with your head turned back, you are sure to have crooked furrows and not use the field set before you to its greatest potential! Look forward. Labor for the Master. God makes no mistakes! I often think this way about homeschooling. I think about keeping on...just walking ahead looking at the path that God placed before my family. Not to my side where I hear the little comments about, 'Yeah, but now he'll be in high school...surely you're not going to homeschool through high school!" Keeping my eyes on the 'prize' is the only way to go. I had my grandmother ask me (for the 215th time)if Nathan was in REAL school now. yeah. 'Cause his algebra, history, biology, Spanish and writing this year has been totally fake. My heart aches for you, Marsha. Thank you for sharing, even the hard stuff. Also appreciate hearing the hard stuff. we all wonder, how could we go on living...but you prove that not only do you go on living, but you do it with grace and wisdom and with the love and support of your heavenly father. You are fulfilling his purpose for your life. You are such an example. Love you! I fear what I will have to surrender. I understand that feeling, and as a mother the fear mostly revolves around losing my child. A family in our community just had a tragic accident this weekend involving the loss of their 2 year-old due to something their older child unknowingly did. The anguish and heartbreak are unimaginable to me -- and so scary. Thank you for showing that with God, a mom can still live and move on after that loss. Thank you, thank you. Wow. You truly are a gift in my life. I may not have lost a child, but I commend your strength and desire the deeper walk you push us all to take. Marsha! God has been working on my heart in this area and I just posted that this morning. He is so patient with me as I slowly loosen my grip on things I *think* I have (knowing everything comes from Him and everything is His). But God is stirring in my heart and even though I know what surrendering means, I don't think I will fully understand until I act in faith and do it. Knowing that to God least means greatest, death means life, etc...I have a feeling that surrender means gain. Love you and lifting you up! I love seeing pictures of Christian! Marsha, Thank you for sharing your wonderful faith. I remember after my brother died I had a dream... I had lost my youngest in a crowd and was searching frantically... my brother had found him and brought him to me. That dream was amazing and I felt so comforted after, like he was there and he would be watching over my boys. Bless you, Marsha. thank you for being willing to lay it all down for the amazing wonderful Savior that we trust so vulnerably. you are a precious sweet example. I love you. You know that, right? I do. Thanks for the reminder. With graduation coming up, my mind has definitely been thinking about the things we are missing. I know better, but that is why it's a battle right? I have been following you for a while now. I found you on THL. Your post today brought me great JOY. I have a "deposit in Heaven too". The Lord saw fit to bring my Josiah to Him on his birthday 10 years ago. I linked this post to my blog http://joycornerfarm.com It is an honor to "know" you. Thank you for all the smiles you have brought to my heart. Abundant blessings of JOY! Your faith is so beautiful Marsha! Though I don't know you personally, I can say what an awesome Christian Mom you are and a wonderful person with a sweet, endearing heart. Take good care. It is so hard for me to sometimes look ahead in faith. I often catch myself looking back at what was, what I wish I could have changed...and so I fear I might miss what is in front of me. That is one reason I'm taking my daughter away from all my distractions on her birthday. To focus on HER. To be present. To enjoy the moment that I have RIGHT NOW and not waste it away. Marsha, I am telling you now that I don't believe I could be as strong as you have been. I have thought about how I would react if I had lost one of my children. I think I would have been angry with God. That is shameful for me to say, but true. I am in awe of your faith and love you for it. You make me want to be closer to God and have that kind of faith. I have often cried with your posts and have prayed for you often. But, I also prayed I would never face a similar situation. Thank you so much for being my friend, and for sharing your thoughts and feelings so honestly with us. You truly do touch us and make a difference. You always touch my heart in just the right place. Thank you once again! Brilliant site, I hadn't come across www.othersuchhappenings.com before during my searches!